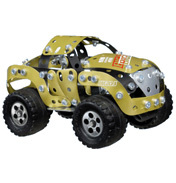 The tuning range offers an exciting alternative to radio controlled cars. As it’s from Meccano not only can you drive it, but build it and customise it first. The cars come packed with lots of cool extras that will really give it the wow factor. Some vehicles come with neon lights underneath the chassis and chrome-plated rims, which every petrol head would love. But it doesn’t stop there. Some models come with flashing front and rear lights, sound effects and even a high quality loud speaker that you can connect to any MP3 player! 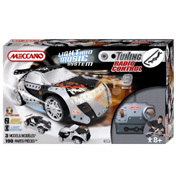 The tuning selection is designed for kids aged 8-14, and I’m sure any young car fanatic or Meccano hobbyist would go mad for something like this, making it perfect for a birthday or Christmas gift. Choose from three different models, Red Hot Racer, Carbon Style and Sound System Blue.